1989, a Watershed in Chinese History? In this essay I look first at some general problems of memory and of how events are retold from memory. Then I focus on memory of June Fourth and divide the question by asking how three categories of people—perpetrators, victims, and bystanders—have remembered, failed to remember, or tried to alter memory. The tripartite division of “perpetrators, victims, and bystanders” is not perfect but I find it illuminating. Nearly all the questions that come up have moral implications, so I call the essay “memory and ethics”. I draw upon examples from literature, memoir, journalism, film, and personal acquaintance. The Chinese pro-democracy movement crushed by the People’s Liberation Army on 4 June 1989 was preceded by many protests by intellectuals. The crackdown deprived the democrats of their protectors in the Party, and forced them to change strategies. Unable to organise large-scale demonstrations, dissidents launched petitions demanding respect for human rights and reversal of the official verdict on June 4th. 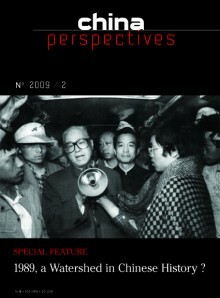 They were joined by the Tiananmen Mothers, who became a new force in the pro-democracy movement. Yet, China’s democracy activists remain largely isolated from the rest of society. This paper is an assessment of Chinese liberal intellectuals in the two decades following June 4th. It provides an analysis of the intellectual development of Chinese liberal intellectuals; their attitudes toward the party-state, economic reform, and globalisation; their political endeavours; and their contributions to the project of constitutional democracy in China. The Chinese Communist Party has politicised the judicial and law-enforcement apparatus despite Beijing’s avowed commitment to global norms. This paper shows how, in the wake of the 4 June 1989 crackdown, the CCP leadership enhanced its control over the courts and procuratorates so as to boost its capacity to punish dissidents, separatists, and other destabilising elements. Despite President Hu Jintao’s slogan of “running the country according to law,” the prospect for rule of law and judicial independence remains illusory. The spring 1989 democracy movement and the massacre of June 4th were a serious challenge to the legitimacy of the Chinese Communist Party. Twenty years on the Party appears to have successfully overcome it, but at the price of a return to the political fundamentals of a Leninist party-state and the use of nationalism as a replacement source of legitimacy. Despite all its efforts to conceal and deform the true history of the 1989 “disturbances” (as demonstrated in school and university text books), the party has not succeeded in ridding itself of this stain on its history. Questions about recognition of responsibility and a possible “reconciliation” continue to haunt it. The social and economic model that emerged out of the Tiananmen crisis was profoundly different from that contemplated on the eve of Tiananmen. China made a firm transition to a high-input, high investment, high growth model of development. The broad but vague social consensus in favor of political and economic reforms that underlay the Tiananmen protests crumbled, while the economy boomed and some people became much better off. In the post- Tiananmen period a strong economic logic and a strong political logic coincided to produce a policy regime that was remarkably consistent and strongly self-replicating. This paper investigates how China’s success in economic development negatively influences civil liberties and democracy as practiced in the West, and asks why the growing economic interdependence between China and the global economy enables China to intervene in the political conduct of leading democracies but not vice versa. Empirically, the paper examines cases of Chinese foreign relations behaviour in which China uses its economic connections with various leading industrial democracies to bend their international political behaviour regarding visits by the Dalai Lama. It also highlights how economic interests relating to the Chinese market make multinational corporations vulnerable to Beijing’s political pressure, and analyses why international capital is easily lured to cooperate with the Chinese repressive state to curb freedom in and outside China. It argues that the new political economy of globalisation in the post-Cold War era explains the rise of this kind of dictator’s diplomacy, and that post- Tiananmen China has greatly contributed to the shaping of a new political economy characterised by state-market collaboration in promoting material prosperity. While refusing to allow any erosion of the Communist Party’s monopoly of political power, the Chinese leadership has proven very skilful in meeting emerging challenges in the era of economic reform and opening to the outside world since the Tiananmen Incident. Retaining its belief that economic growth remains the key to Hong Kong’s social and political stability, the Chinese government preserves the united front framework in its Hong Kong policy, with no intention of introducing genuine democracy. • Yu Jieyun, “Proposals for transferring pension funds,” Xuexi Ribao(Study Times), 2 February 2009. • Chen Shanzhe, “According to the Ministry of Social Security, provincial level pension funds will be set up within a year,” Nanfang Zhoumo(Southern Weekend), 3 February 2009. • Zhang Liangui, “Lacking a bottom line, Americans have become mired in North Korea’s nuclear imbroglio,” Huanqiu Ribao (Global Times), 3 March 2009.